Quantity Discounts. Many of our products have quantity discounts. Some laboratories cannot always purchase the largest quantity at one time, space constraints being a common example. 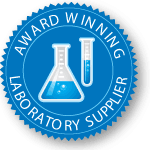 However, when you place a standing order for these specially marked products, in a quantity meeting or exceeding the largest quantity break, you can specify shipping releases of lesser quantities, but you will be eligible for the best possible pricing. Delivery Timeframe Tailored to Meet Your Needs. Standing Orders can be established for delivery once a week, once a month, every other month, or in any timeframe that best meets your needs.